Correction: The Japanese Prime Minister and I Have One Thing in Common. Yes, you read it here first: The Queen ♥ The King. Then one day, when The Queen was still a young princess in Cincinnati, her mother made an announcement: Big E was coming to town, and by God, The Princess was going to accompany her to the show. Naturally, I was all shook up. 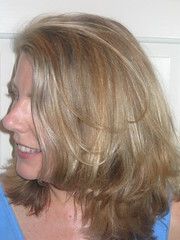 I can’t exactly remember which strong-arm tactic (bribery or threat) my mother used, but I went to the concert with her. In the car, she promised me that it was crucial to witness Elvis’ splendor now, since he wasn’t going to be around forever. A very prescient comment, as that concert -- June 25, 1977 -- turned out to be the penultimate of his too-short career. And by the time he began crooning Can’t Helping Falling in Love, I already had. 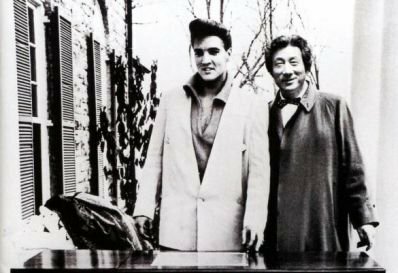 Even then, in less-than-peak physical condition, Elvis’s charisma was enough to make a teenager blush. The atmosphere sizzled with women tossing all sorts of things onto the stage – teddy bears, hotel keys, and enough lingerie to fill a Frederick’s of Hollywood store. For one heady moment, I wondered if he might have any interest in pink cotton bikinis with Thursday embroidered on them. Then I remembered that I was sitting next to my mother. We all know the sad ending to this tale: Elvis Aron Presley, 1935-1977. But what about the pie, you ask? 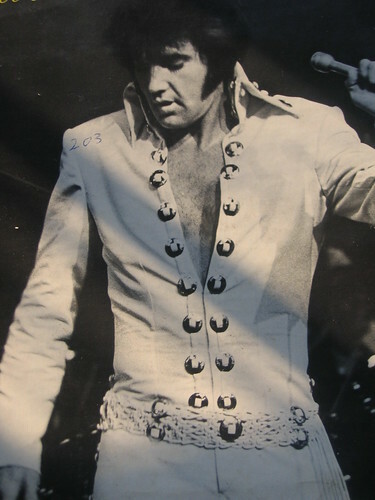 Well, let me remind you that the commemorative Elvis Week (August 8-16) begins shortly. (It’s not yet been declared a national holiday, but I’m helping you to stay ahead of the curve here.) 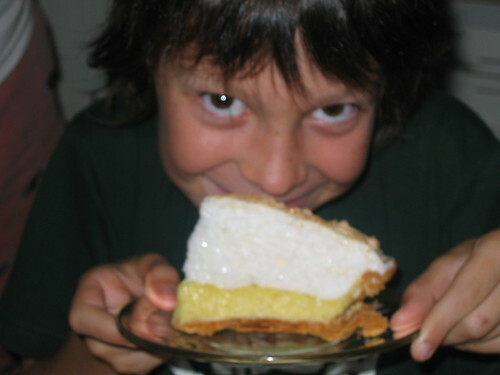 Since you’ll want to celebrate appropriately, I’m dishing up Elvis’ favorite pie: Lemon Meringue, according to Kara, a knowledgeable internet resource. A confession: I don’t even like meringue. If this were my pie, I’d substitute a nice swath of soft-whipped cream atop the tangy lemon layer. 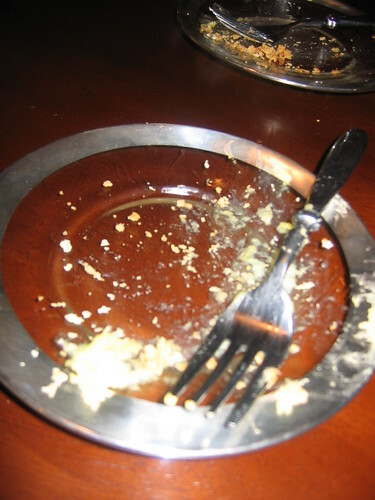 But this isn’t my pie, and for once, The Queen defers to The King. Haven’t you ever made a sacrifice for the one you love? It’s Now or Never. . .
Make meringue by placing egg whites, cream of tartar, and vanilla in mixing bowl. Beat egg whites until soft peaks form. Gradually add sugar and continue beating until stiff peaks form – about 2 minutes. Make filling by whisking egg yolks in medium bowl.. Set aside. In a saucepan, whisk together cornstarch, water, sugar, and salt. Over medium heat, stir frequently until mixture comes to a boil. Boil for 1 minute. Remove from heat and gradually add half of hot mixture to egg yolks, whisking constantly. Return egg mixture to remaining mixture in saucepan. Turn heat to low and cook, stirring constantly, for 1 more minute. Remove from heat and stir in butter, lemon juice, and zest. Pour mixture into pre-baked pie shell. Spread meringue over lemon filling while filling is still hot. Make sure meringue covers filling all the way to edge of the piecrust. Bake for 10-12 minutes or until meringue is golden brown. Remove from oven and cool completely before refrigerating pie. From the title of this thread, I though you were going to say that George Bush threw up on you. But this week's choice of pie is very relevant to my life. First, I'm currently working on learning how to play (on piano) "I Can't Help Falling In Love With You." Really! BTW, it was written not by Elvis, but by George Weiss, Hugo Peretti, and Luigi Creatore. But I'm sure everyone knows that. Secondly, I love lemon meringue pie! Mother Markb says that back in the olden times, when I was just an infant, a nurse would come to our apartment in NY to help out with newborn baby stuff. Anywho, she wasn't a particularly good or attentive nurse (which probably explains a lot about me), but she'd spend her time at the apartment making lemon meringue pies. 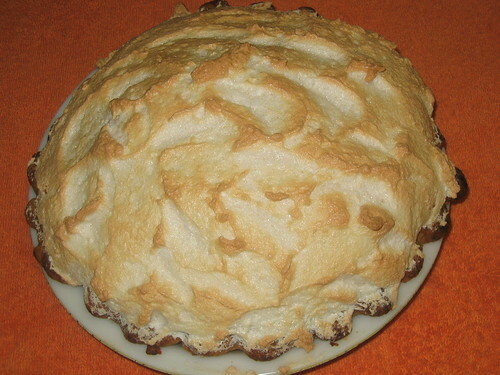 Question: Why is "meringue" pronounced "mer-ang'"
Because if you pronounce it "muh-ren-gay," you're talking about a Latin ballroom dance, not a delicious pie. markb, Wanna swap? A lemon meringue pie for a bit of ear candy? You wouldn't happen to sing, too, would you? Anonymous, Blame it on the French. And that would be merengue, markb. Believe me, I'd get the *much* better end of that deal, your Tartness. And no, I don't sing. At least, not well. Flud, Ruy, this is Hroosh. He was shocked.